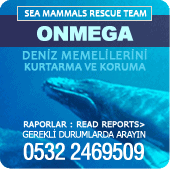 Dear Mr Turgay and the Onmega Dolphin Center team. After returning from Marmaris I would like to give you an interim Report. First of all I shall write about changes in Samir during the first month. Samir’s improvement in co-ordination was almost unbelievable. These positive developments were reflected in his work at school. My son, with whom I had great difficulty getting him to walk, now walks without problems. He can concentrate a lot better. Samir now follows all instruc tions from his teacher. Everyone has noticed a wonderful change in Samir. Dear Mr Turgay, this is mostly your doing – my whole life I shall thankfully think on what you have done for us. Dear Axel, Dear Elena, I would simply like to congratulate you for the perfectly prepared Dolphin Therapy and the enthusiastic engagement of your team. It was a wonderful experience to see at first hand how much work and enthusiasm is invested in in the treatment. We thank you for the excellent support. As an animal lover, I thank you that – with Axel’s thoughtfulness – the angels of the seas are so well-treated and cared for. 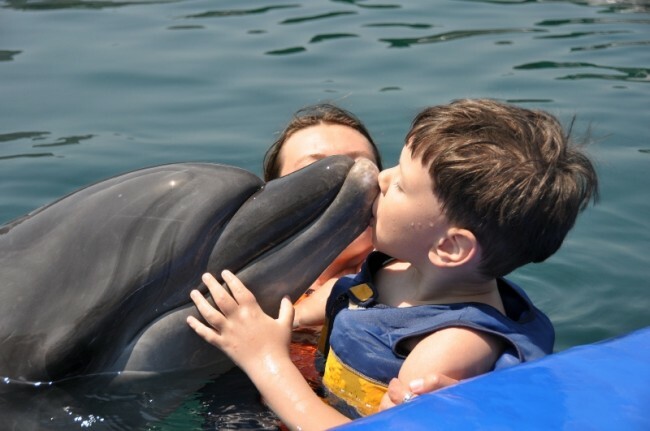 The Dolphin Therapy sessions with you were simply wonderful. Samir was previously a child who was afraid even to enter the water. With you he had a great time. He was able, with your assisstance, to conquer his fears and worries and became more and more alert. 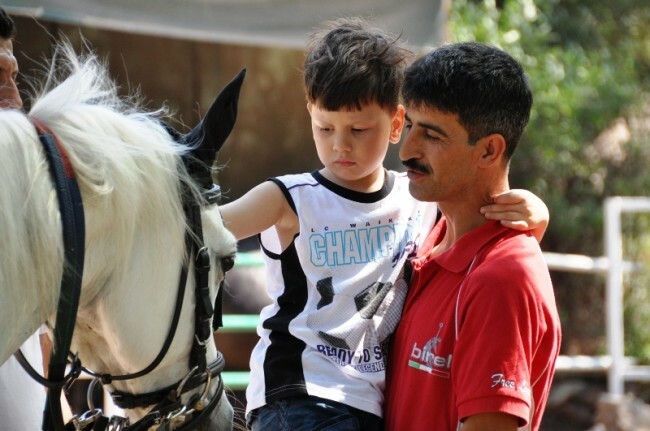 through all the therapies you gave us faithful support – and so lovingly took care of Samir. You answered all my questions with the patience of an angel. 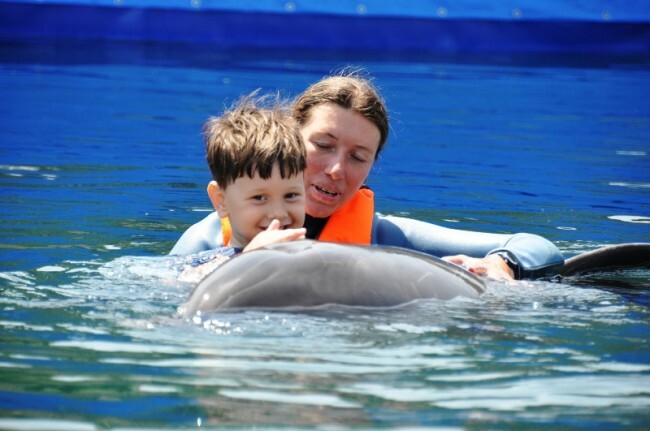 Thanks to you I have learnt a lot about Dolphin Therapy. Many, many thanks. Many , many thanks that you so patiently and lovingly translated for us, so that even my smallest question could be explained and answered. Also your Cranio Sacral Therapy played a big part in helping Samir to control his body and contain his nervousness. The deficit of his sense of touch that you discovered was unnoticed by all previous doctors’ examinations. Now in Istanbul I have been able to approach a hopefully suitable Center for further treatment, which begins next week. I shall inform you of developments. Your ergotherapeutic treatment was anything but boring for Samir – for him it was a lot of fun. He looks at the pictures of himself and laughs. If I could find a therapist in Istanbul that works so professionally as yourself, I would continue the treatment. Many thanks for everything. I would also like to thank Mr Salih and his loving wife Felis for their lovingly taking care of Samir. We experienced wonderful moments at the Ranch. I will never forget how happy Samir looked on the horse and especially the look of confidence in his face as he rode on his own.